Amir Hussain is professor of theological studies at Loyola Marymount University, the Jesuit university in Los Angeles, CA. His own particular speciality is the study of Islam, focusing on contemporary Muslim societies in North America. Although born in Pakistan, Hussain immigrated to Canada with his family when he was four years old. His academic degrees (BSc, MA, and PhD) are all from the University of Toronto, where he received a number of awards — including the university’s highest award for alumni service. Hussain has a deep commitment to students, and holds the distinction of being the only male to serve as Dean of Women at University College, University of Toronto. Before coming to California in 1997, he taught courses in religious studies at several universities in Canada. In 2008, Hussain was appointed as a fellow of the Los Angeles Institute for the Humanities. 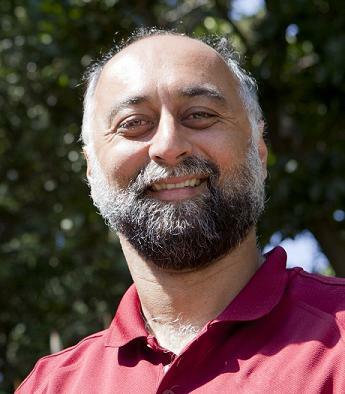 Prior to his appointment at Loyola Marymount University, Hussain taught at California State University, Northridge, from 1997 to 2005. He won a number of awards there, both for his teaching and research. In 2001, he was selected for the outstanding faculty award by the National Center on Deafness. For the academic year 2003-2004, Hussain was selected as the Jerome Richfield Memorial Scholar. In both 2008 and 2009, he was chosen by vote of Loyola Marymount University students as Professor of the Year. RSN: So, how has the first year been? Hussain: I can’t believe how much work is involved in editing the JAAR. I suppose every new editor says that, but I can’t believe how much work there is in being the editor of the JAAR! And I came into this with eyes wide open. I spoke with the previous editors, Chuck Mathewes and Glenn Yocum, and they both said the job took up about half of their time. Clearly, they worked at least twice as hard as I do, as I’m finding that this takes up almost all of my time. RSN: What makes it such a time-consuming job? Hussain: Part of the answer is that we here at Loyola Marymount University are a small operation. We have an administrative assistant who works with us and I have four graduate students to help. David Sánchez, our book review editor, has two students who help him with the book reviews. I have a half-time release from my teaching, but that still means I teach three courses a year. Couple that with the volume of submissions — we get about 300 article submissions a year — and the fact that we want to give each submission the thoughtful consideration it deserves, and that means we can’t go at a fast pace. The other part of the answer is that we have introduced some changes, most notably the Scholar One system for manuscript submission. So a lot of our time has been taken up in working with Simone, the Oxford University Press web person, to design a version of the software that would work for us, and the rest of the time has been spent in learning how to use the system. The system will certainly make things much easier in the years to come. RSN: So, what are you liking most about the job? Hussain: The selfish reason for becoming the editor was to be able to provide an incredible learning experience for our students. They are able to see submissions, reviews, revisions, and the final published pieces. That’s an amazing opportunity for them, and there’s no better way for me to help them with their scholarly writing than to show them how it works in the best journal in the field. And of course my learning curve about the study of religion has gone through the roof, as I get to read all of these articles and work with such a diverse group of authors. RSN: What are your dislikes? Hussain: Well, and I’ll try to put this as delicately as I can, I sometimes feel the need to remind authors that it may take some time before they hear from us. Part of that is the small staff that I mentioned above. We really can only work through about two or three submissions a week. Part of the process is finding reviewers. Once we read something in-house and think it should go out for external review, we need to find two reviewers who are qualified and able to do review the particular subject matter. Sometimes that means asking four or five scholars before we find the two reviewers. And because we don’t want to sacrifice quality and scholarship in the interests of time, it may take some time for the reviews to return their feedback. And if one review is positive and one is negative, it may need a third review. So, and I’m not making this up, if you’ve submitted your article to us, don’t e-mail me a week later to see if we have made a decision. RSN: What else have you learned from your first year? Hussain: I’m really proud of the work that we have done. We’ve published our first color image online and want to be able to do more of that in the future. The production work that Amy and Lisa have done at Oxford University Press has just been phenomenal. We have also made a number of articles available for free, and done cross-promotion with other journals (That’s thanks to Stephen and Michelle at OUP.) All of this is to make the journal more accessible and to try and increase our readership. I think we publish excellent work, and I want as many people as possible to be able to read it. That’s partly why we began each issue this year with a poem. I have no desire to turn the JAAR into a literary or a poetry journal. But I think that opening with a poem might help us to understand things in different ways. So for example, as a scholar of contemporary Islam who has lived in the United States since 1997, I could have written an editorial note for the September issue on the tenth anniversary of the 9/11 attacks. But I think Wole Soyinka’s poem “Twelve Canticles for the Zealot…” says much more in fewer words than I ever could. Plus, of course, he’s a much better writer than I am. RSN: Any advice to authors who are submitting their work to JAAR? Hussain: It’s very easy to tell if an article has been written for JAAR, or if it has been written for another scholarly journal. The citations (we use in the text, not footnotes) and references are a dead giveaway. Of course, we won’t reject a paper if it isn’t submitted in the proper format, but we also know that means the author isn’t familiar with our journal. Take a look at the articles that we do publish to get a feel for, well, the kinds of articles that we publish. Make sure you have a good abstract that tells the reader both what you are doing in your article, and why the doing of that is important. And don’t send us things that are poorly written with lots of typographical errors. RSN: Anything else in the works for JAAR?